The Fall Bridal Show season kicks off for dSy invitations this Sunday as I am setting up for my first Iowa bridal show. I’ll be at the HyVee Conference Center Everything Bridal Show this Sunday, September 7 in Des Moines. It’s crazy the new invites I have to show off this year. My last bridal show was in January in Omaha and I have designed for close to 40 brides since that time. FORTY. So I have a few challenges with all of that. 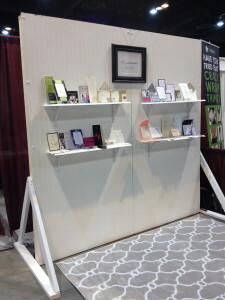 First, my tradeshow booth set up has not only been out of commission since January, but it also has gone through a move. Actually a few moves. My “walls” went from my garage, to a storage unit, to a rental house and now finally into the garage of our new home. They don’t look bad but will get a lot of TLC on Saturday to get them looking great for the bridal show Sunday. Secondly, what invites do I showcase? Forty new ones?!?! Plus ones from previous years that I still love?!? 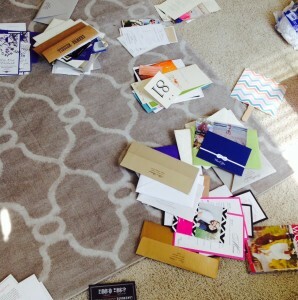 Right now, I have a pile of 14 invitation packages that I have pulled to be my top choices. From different sizes, to pockets, to unique to classic, I tried to get a little of everything. I’m throwing in Save the Dates, ceremony programs, thank you cards, reception menus…you name it. If you’re a new bride in the Des Moines area, I would love to see you this weekend. I will be doing Des Moines Invitation Consultations on Thursday, September 11 and am asking brides to sign up Sunday for these free consultations. I plan on doing more if the demand is there! Also, I will be at the Preferred Bridal Show in Iowa City on November 2. Winter bridal shows are still TBD but I will have those on my Facebook page and website as soon as I know. Organized chaos as I prepare for the Everything Bridal Show. My bridal show booth. My “walls” that were created by my master craftsman (aka my hubby).